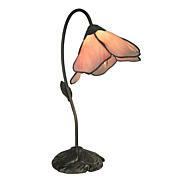 Our Dragonfly Sculpture Accent Lamp is a colorful work of illuminated art that will be at home in any decor. The deep dome shade features a background of blended blues and greens with deep filigree to create the illusion of foliage. 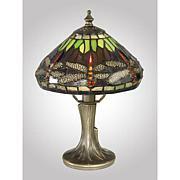 A group of Tiffany’'s signature dragonflies is set wing to wing around the bottom edge of the shade. Their wings are crafted of intricately patterned filigree and their bodies are fiery orange with art glass gem eyes. 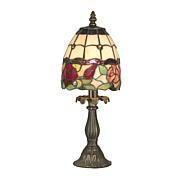 We have added a row of scarlet glass gems around the middle and rectangular glass pieces around the top of the shade add extra color and texture. 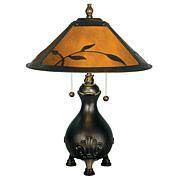 The metal base is finished in Antique Bronze and features a thick pedestal on which a graceful dancer is posed under the shade. 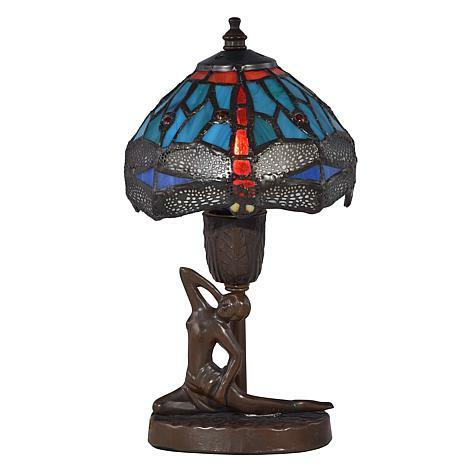 The perfect pop of vibrant color anywhere in your home, our Dragonfly Sculpture Accent Lamp also makes the ideal gift for just about any occasion.